September 04, 2018, 5:00 p.m.
NBC’s TV shows have built somewhat of a cult-following over the years, particularly around its hit comedies. The network revamped The Office to wonderful comedic effect, popularizing the mockumentary genre along the way and paving the path for another fan-favorite, Parks and Recreation. Despite the fact that both shows have come to an end, NBC keeps the laughs coming by picking up Brooklyn Nine-Nine after its cancellation from Fox. 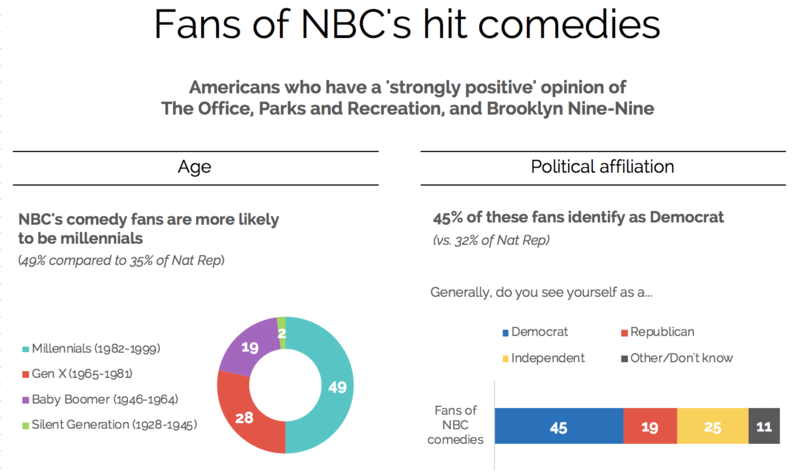 Data from YouGov Profiles provides insights into fans of The Office, Parks and Recreation, and Brooklyn Nine-Nine. 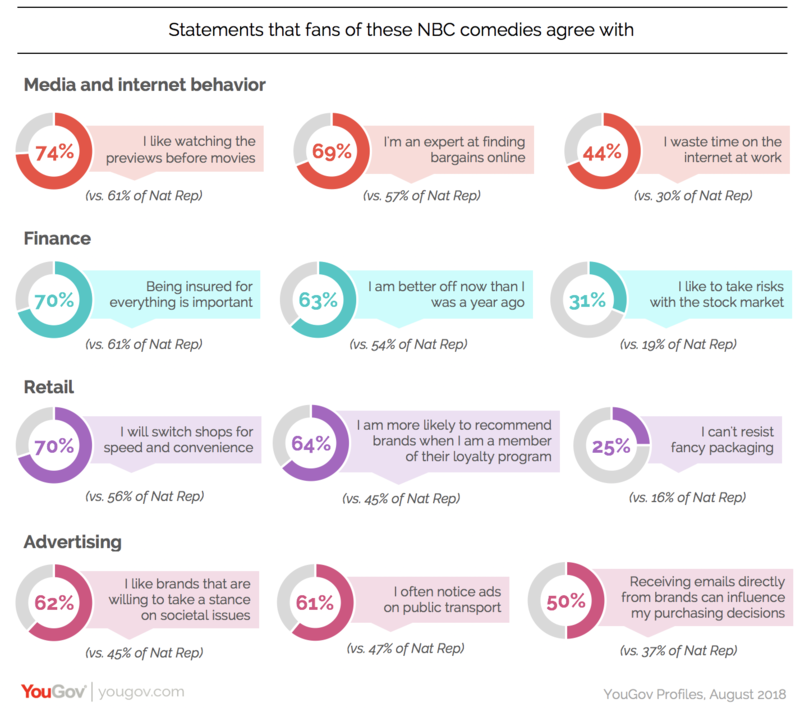 With NBC set to release two new comedies, I Feel Bad (2018) and Abby’s (2019), understanding how this audience behaves and thinks in the real-world can help with engagement and inform advertising decisions for those shows. People with a ‘strongly positive’ opinion of the sitcoms tend to be younger and are more likely to hail from the Northeast or Midwest. Two in five fans (39%) identify as minorities and nearly the same number (45%) identify as Democrat. More than a third of these fans (37%) contribute to a household that earns more than $60,000 a year, an indication of the group’s spending power. A look at what these fans are thinking – from their attitudes towards advertising to their general worldviews – offers a fuller picture of who they are. When it comes to matters of finance, this segment tends to be optimistic, with a majority (63%) saying they are better off this year than the last. Many in the group are receptive to advertising and report that they are influenced by channels like branded emails or movie previews. 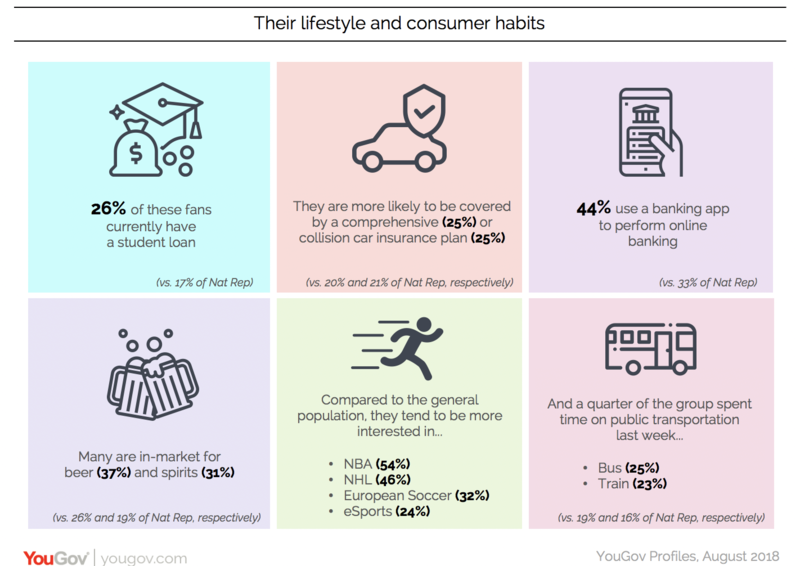 Their consumer habits hint at the potential moments that brands can connect with these fans. This group tends to be interested in sports like basketball and hockey, and many are paying off their student loans. A quarter of the group also spent time on public transportation last week; taken in conjunction with their propensity to notice ads in such places (61%), trains and buses may serve as effective spaces to advertise. Fans of these shows tend to have a positive opinion of different people and programs. 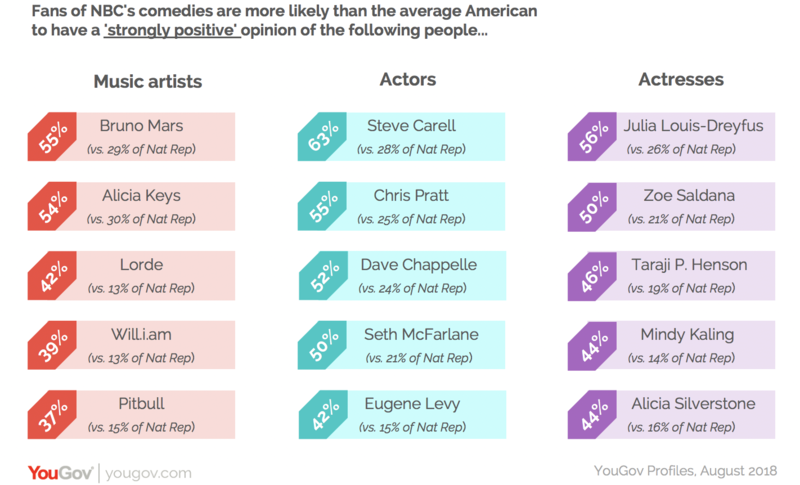 The latest data from YouGov Ratings reveal that a few of their favorite actors and actresses star in The Office or Parks and Recreation. 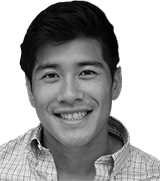 Brands looking to work with certain celebrities can use this information to glean who would resonate most with this audience.